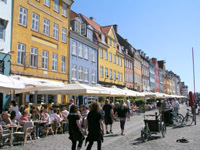 København (Copenhagen) is Denmark's vibrant capital city. With its colourful buildings and distinct lack of skyskrapers it has a charm of its own. The pedestrianised Strøget is very pleasant to stroll around, day or night. There are lots of places to eat and drink and plenty of things to have a good look round. Denmark is not the cheapest country to visit, particularly with the poor exchange rate I seem to get at the moment, but it is very easy to get by as everyone seems to speak such fantastic English. This is probably just as well, as my Danish is erm, somewhat limited.